The young are explorers! This way and that way, they move about in the world - ever learning, ever growing, wanting to know more, more, more! 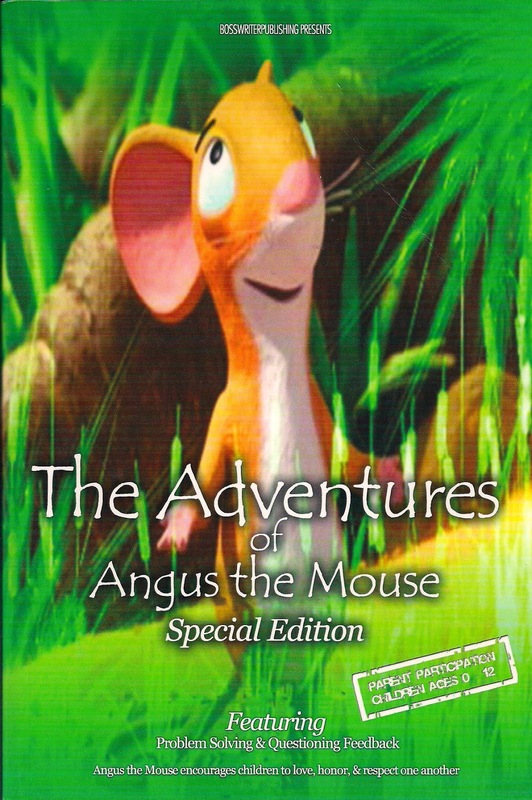 In Montice Harmon’s delightful tale, The Adventures of Angus the Mouse, we see this exploratory spirit in action as Angus encounters the pitfalls of venturing far from home and learns valuable moral lessons about the kindness of strangers, the power of prayer, and the love of family! Angus’ adventure begins on a sour note. As the baby of the family, he is considered “… too young to be playing with [his] brothers…”, and his sisters “…sometimes [only] like to play with girls” (Harmon 7). This upsets Angus to the point of tears, but a trip into town with his mother is just the thing to cheer him up. It is during this trip, however, that Angus faces unimaginable dangers, and his brothers and sisters are forced to realize just how much they love their little brother! Angus and his mother are separated during the trip by an encounter with an angry black bird looking to eat them both! Unfortunately for Angus, he falls off of a cliff into the river below! Right away, Angus learns his first lesson - the kindness of strangers - because it is Sam the Rat that initially saves his life and Edward the Beetle who assists him in finding his way home. We often tell our children, as I have many times, to beware of strangers. But in these instances, it was the kindness of a stranger that saves Angus from death and starvation. And when Angus gets sad, lonely, and frustrated that he will never see his family again, it is also Sam who reminds Angus that “…sometimes in life, kid, you have to hold on to a word called faith and believe in the impossible” (22). Meanwhile, Angus' family is crushed at his disappearance! Little does Angus know that while he is missing, the same brothers and sisters who would not play with him had “…gathered around and prayed for Angus to return home safely” (20)! And when he does eventually arrive home safe and sound, they are overjoyed to see their little brother! Angus is really glad to hear that he was missed and he “…couldn’t wait to tell them about [his adventures on] the other side…” (37)! Once again, two more great lessons - the power of prayer and the love of family - communicated by a simple children's tale!